Clemson bioengineering assistant professor David Kwartowitz works with a student Creative Inquiry team conducting research to prevent sports concussions. CLEMSON, S.C. – Clemson University researchers and students are tackling a national health concern by advancing concussion awareness and prevention through research. 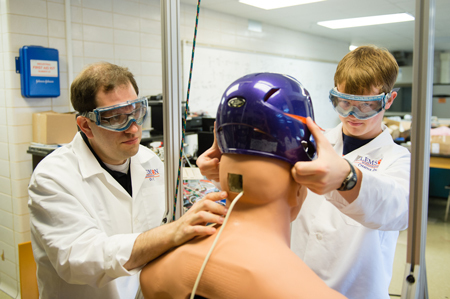 David Kwartowitz, John DesJardins and Delphine Dean, assistant professors in the department of bioengineering at Clemson, are mentoring an undergraduate Creative Inquiry student research team that is investigating the scientific implications of concussions. The students designed a dummy that is equipped with brain sensors that provide concussion data. The students built a track system to strike the head of the dummy with numerous objects, including weights, footballs, baseballs and helmets. Using the track system, the researchers can manipulate the impact of these objects and the sensors provide instant concussion results. The dummy simulator eventually will be displayed in Greenville at the Roper Mountain Science Center’s newly renovated health research facility, which has 120,000 students visiting annually. The researchers plan to make their findings available to athletes, coaches and parents at a time when concern about concussions is high. More than 29,000 concussions were reported in all NCAA sports from 2004 to 2009, with 16,277 in football, according to the National Collegiate Athletic Association Injury Surveillance Program. Concussions in collegiate and professional sports have been making the news, but youth athletes are facing even higher risk. Sanderson, who is conducting research on the media’s portrayal of concussions and fans’ perceptions about player safety, notes that communication is key to athlete safety. However, communication barriers are rampant at every level of sports. If coaches and parents shame players who report injuries, long-term damage can result, he said. Sanderson teaches sports communication courses in which students examine a variety of issues, including concussion awareness and prevention, parent behavior in youth sports and social media’s influence on sports.